Eight of the 10 largest wind farms in the world are operated in the US, with five situated in Texas alone. Just one offshore wind farm has made to the list, while all others are onshore. Power-technology.com profiles the world's 10 largest wind farms based on installed capacity. Shepherds Flat Wind Farm in Eastern Oregon, US, is the second largest in the world with an installed capacity of 845MW. Image courtesy of Elekhh. The 781.5MW Roscoe Wind Farm in Texas, US, currently ranks as the world's third largest wind farm. The 735.5MW Horse Hollow Wind Farm in Texas, US, comprises of 423 turbines. Image courtesy of Mandy Lackey. The 662.5MW Capricorn Ridge Wind Farm is located in Sterling and Coke counties of Texas, US. The turbine installation at the 630MW London Array Offshore Wind Farm was completed in December 2012. Image courtesy of London Array Limited. The 600MW Fantanele-Cogealac Wind Farm in Romania is currently the largest onshore wind farm in Europe. Fowler Ridge Wind Farm in Indiana, US, has an installed capacity of 599.8MW. Image courtesy of Retromoderns. The 585.3MW Sweetwater Wind Farm in Texas, US, is jointly owned by Duke Energy and Infigen Energy. Image courtesy of fieldsbh. Where are the biggest wind farms in the world? Power-technology.com has taken a look and ranked the top 10 biggest. Alta Wind Energy Centre (AWEC) in Tehachapi, Kern County, California, is currently the largest wind farm in the world with an operational capacity of 1,020MW. The onshore wind farm is owned and operated by Terra-Gen Power. Construction is underway to expand the wind farm’s capacity to 1,550MW. The first five units of AWEC were commissioned in 2011. Two additional units were installed in the next year. The first unit consists of 100 GE 1.5-MW SLE turbines. The other six operational units are installed with Vestas V 90-3.0MW turbines. Four more units were in various stages of completion as of mid 2013 at AWEC. The eighth and ninth units use the same Vestas turbines. The last two units are being installed with GE 1.7MW and GE 2.85MW turbines. When combined, all 11 units of the wind farm will have 586 turbines in total. The 845MW Shepherds Flat Wind Farm located near Arlington in Eastern Oregon, US, is the second largest wind farm in the world. The wind farm, developed by Caithness Energy, covers more than 30 square miles in the Morrow and Gilliam Counties. The Shepherds Flat Wind Farm project broke ground in 2009 with an estimated cost of $2bn. The project received a loan guarantee of $1.3bn from the US Department Energy in October 2010, which made it the world’s largest financed wind farm. The wind farm commenced operations in September 2012. Shepherds Flat comprises of 338 GE2.5XL turbines, each with a rated capacity of 2.5MW. The power output of the wind farm is supplied to Southern California Edison. The renewable power generated by the wind farm is sufficient to serve 235,000 households. Roscoe Wind Farm located 45 miles south-west of Abilene in Texas, US, is currently the third largest wind farm in the world. The 781.5MW wind farm is owned and operated by E.ON Climate and Renewables (EC&R), a Germany-based company. Covering 400km² of farmland, the Roscoe wind farm comprises of 627 wind turbines placed 900ft apart from each other. The renewable power project was built in four phases between 2007 and 2009. It became operational in October 2009. The first phase of the wind farm comprises of 209 Mitsubishi 1MW turbines. The second phase is installed with 55 Siemens 2.3MW turbines. The third and the fourth phases feature 166 GE 1.5MW turbines and 197 Mitsubishi 1MW turbines respectively. Horse Hollow Wind Energy Centre located in Taylor and Nolan County, Texas, US, is currently the fourth largest wind farm in the world. The 735.5MW wind farm is owned and operated by NextEra Energy Resources. Horse Hollow wind farm was commissioned in four phases during 2005 and 2006. Blattner Energy was the engineering, procurement and construction (EPC) contractor for the project. The electricity generated by the wind mill is enough to meet the power needs of about 180,000 Texan households. The wind farm covers an area of 47,000 acres. The first three phases of the project are installed with 142 GE 1.5MW wind turbines, 130 Siemens 2.3MW wind turbines and 149 GE 1.5MW wind turbines respectively. Capricorn Ridge Wind Farm, located in Sterling and Coke counties, Texas, US, currently ranks as the fifth largest wind farm in the world. The 662.5MW onshore wind farm is owned and operated by NextEra Energy Resources. The wind farm was built in two phases. The first phase was commissioned in 2007 and the second phase in 2008. GE Energy Financial Services and JPMorgan Chase announced they would invest $225m in the Capricorn Ridge wind farm in February 2012. The wind farm is installed with 342 GE 1.5MW wind turbines and 65 Siemens 2.3MW wind turbines. Each turbine measures more than 260ft tall from ground to the centre of the hub. The wind farm powers more than 220,000 households. The London Array Offshore Wind Farm, the largest offshore wind farm in the world with an installed capacity of 630MW, ranks as the world’s sixth largest wind farm. It is located in the outer Thames Estuary more than 20km off the coasts of Kent and Essex. London Array was officially opened in July 2013. It is owned and developed by Denmark’s Dong Energy, Germany’s E.On and the Abu Dhabi-based Masdar. Offshore construction of the £3bn ($4.8bn) offshore wind project started in March 2011. The last turbine was installed in December 2012. The wind farm comprises of 175 Siemens 3.6MW wind turbines rising up to 87m above sea level. The rotor diameter of each turbine is 120m. The offshore wind farm has the capacity to power about two-thirds of Kent’s households. The 600MW Fantanele-Cogealac Wind Farm in the Dobruja province of Romania is the seventh largest wind farm in the world. The wind farm is spread across 2,700 acres of open field 17km west of the Black Sea shore. CEZ Group owns and operates the facility. Fantanele-Cogealac is currently the largest onshore wind farm in Europe. The first turbine of the wind farm was installed in June 2010 and the last turbine was grid connected in November 2012. The 240 GE 2.5 XL wind turbines with a rated capacity of 2.5MW each account for about one tenth of the total green energy production in Romania. The turbines have an average rotor diameter of 99m. Fowler Ridge Wind Farm, located in the Benton County, Indiana, US, is the eighth largest wind farm in the world. The wind farm was built in two phases and has a total installed capacity of 599.8MW. BP Alternative Energy North America and Dominion Resources jointly own and operate the facility. Construction of the wind farm spreading across an area of 50,000 acres started in 2008. The second phase became operational in 2010. The wind farm has the capacity to meet the power needs of 200,000 average households. 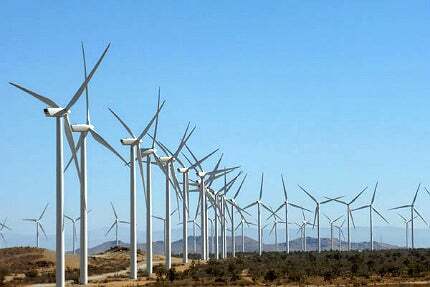 The wind power facility comprises of 182 Vestas V82-1.65MW turbines, 40 Clipper C-96 2.5MW turbines and 133 GE 1.5MW wind turbines. The power output is fed to the PJM grid network. The 585.3MW Sweetwater Wind Farm, located in Nolan County, Texas, US, currently ranks as the ninth largest wind farm in the world. The onshore wind farm is jointly owned by Duke Energy and Infigen Energy. The wind farm was built in five phases. The first phase began commercial operations in 2003. The remaining four phases were commissioned by 2007. Austin Energy and CPS Energy buy the renewable power generated by the facility. Sweetwater Wind Farm consists of total 392 turbines including 25 GE S 1.5MW wind turbines, 151 GE SLE 1.5MW wind turbines, 135 Mitsubishi 1,000A 1MW wind turbines and 81 Siemens 2.3MW wind turbines. Buffalo Gap Wind Farm, situated 30km south-west of Abilene, Texas, US, currently ranks as the tenth largest wind farm in the world. The onshore wind farm owned by AES Wind Generation has an installed capacity of 523.3MW. Buffalo Gap Wind Farm was built in three phases. The first phase was completed in 2006. The last two phases were commissioned during 2007 and 2008. The generated electricity is sold to Direct Energy Texas. The first phase of the wind farm consists of 67 Vestas V-80 1.8MW wind turbines. The second and third phases comprise of 155 GE 1.5MW wind turbines and 74 Siemens 2.3MW wind turbines respectively. Germany’s renewable energy push: a promising or poorly planned initiative? Germany’s vigorous support for renewable energy may have become more than the country can handle.